Tape-in hair extensions are thin strips of clear polyurethane with hair attached to tape on one side. Tape-in extensions attached on either side of a small parting of hair and this is called the “Sandwich” technique. If the tape-in’s do not line up on each end, just remove the extension that was applied second and reapply it until it lines up. Unlike keratin tips, Tape-in’s can be applied higher up on the crown and they tend to work well for customers with slippery hair. Wash hair with clarifying shampoo, twice, and do not condition. Blow dry well making sure there are no knots or tangles present. Starting at the bottom make a clean horizontal part and clip top section out of the way. Peel off the tape-in extension. Line up the extension even with the scalp and press the sticky side directly onto the hair about ½ inch from the scalp. Apply firm pressure sliding your fingers along with pressure for 5 - 10 seconds. Lift the extension and using a rat tail comb, removing any loose hair that may be hanging out under the extension. Make sure the section of hair your first extension adhered to is thin enough, otherwise the extension will not bond. Peel the tape off the second extension and hold it upside down. 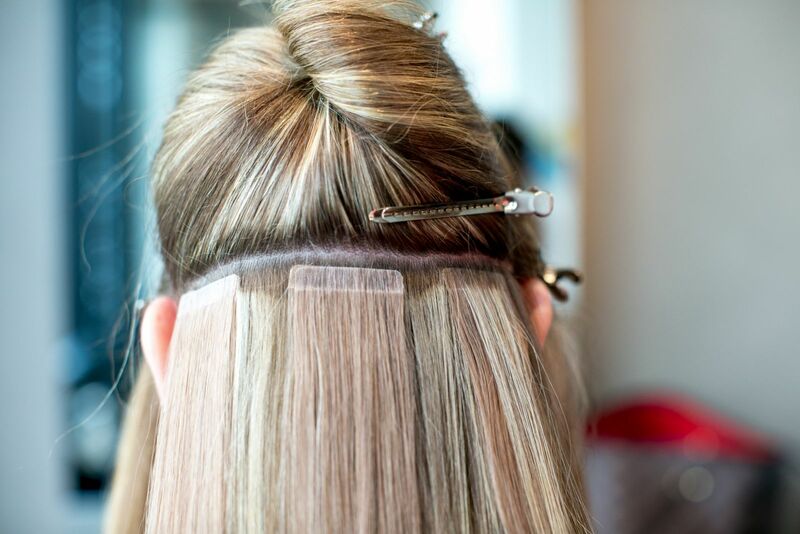 Line up the sticky side with the first extension and press the extensions together making sure they line up exactly. Let extension down and continue on, working your way up the head using the head shape as a guide for your pattern. Extensions can be applied 1 cm apart from one another. If an extension is too far out on one end of a section, it will be visible. You’ll want to use your eyes and make sure the top of the section is covered by the natural hair. Note: Single sided tape may be used in place of the second extension to make a lighter weight extension. AT HOME CARE: Be sure and educate your customer on how to care for her new extensions to ensure the longest lasting results possible. Let her know she can apply pressure to her tape-in extensions where they are bonded to keep them attached longer. Suggest sectioning and brushing hair at least two times a day to prevent tangling. Shampooing should be done at least 24 - 48 hours after extensions have been applied. Advise her not use any shampoos that contain silicone or moisture. Any conditioners must be used from the mid-shaft down. It is best if hair products stay off of the panel where the hair is bonded. Before blow drying, find her a product that will protect her investment from heat styling tools. Always suggest shampoo and styling products that are safe to use at home with tape-in extensions.